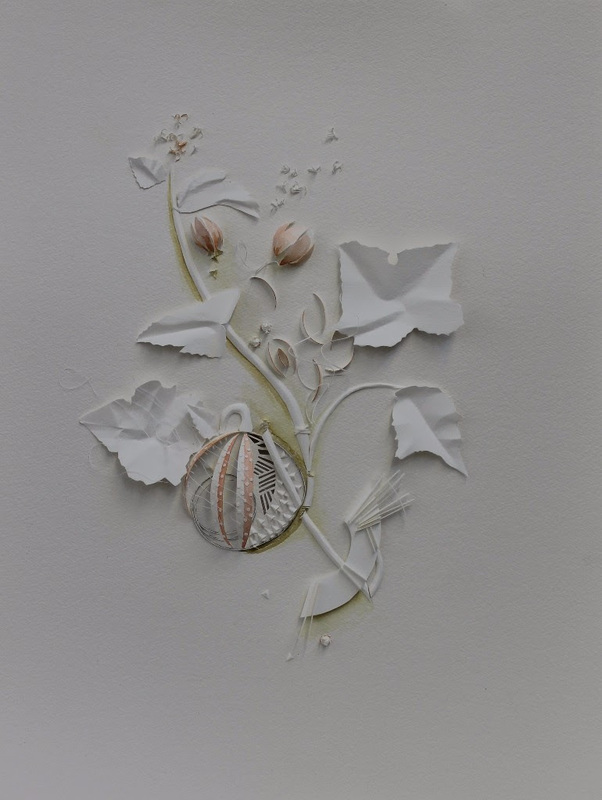 These works started some three years ago when I saw a box of postcards of antique botanical images at the British Library. My first thoughts were about how these images were the height of knowledge at the time, but also, oddly enough, this is still how on average we see these plants and fruits as though only understanding them through what is visible to the eye. Scientific process has enabled us to see far more than that which is easily visible at first glance. My work in the past has looked at both the surface and structure of our interactions with nature. These visual constructions, both in low relief and sculptural form, continue in that vein of investigation. What do we know? What do we not understand yet? In an open source economy who is playing with what forms of life? If they can patent types of apples, where are we headed? There was a time when we postulated theories of what things were made of, purely by guesswork. We have learned so much more and moved from these early images, yet still, do we understand the natural world any more clearly? 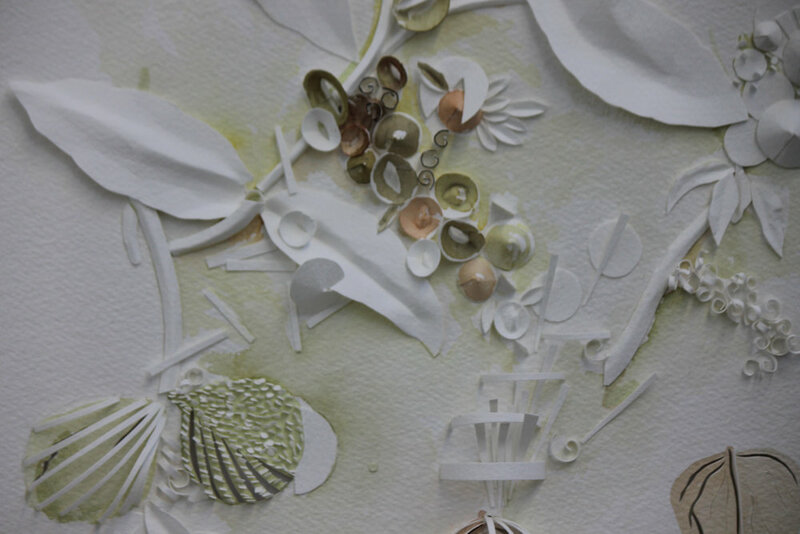 As I began the works, I was interested in understanding the structure and aesthetic qualities of the image, but over time, I understood that I was working intuitively, connecting to the essence of the specific plant. I felt connected, and this was good. The small sculptures became part of my learning, another touchstone to the natural world with my own additions of understanding attached. Beads became cellular structures, thread became connective tissue and extruded plastic became hair like tendrils emanating from plant life. Who knows and do we care? What will guide us, how will we go forward? David Bobier‘s art practice is consistently engaged in expanding multi-sensory artistic experiences. In this exhibition Bobier uses circular patterns typically found in elements of nature to form the basis of the large-scale tactile pyrographic drawings presented in the exhibition. From depictions of cross sections of trees to visualizations of sounds created by dolphins, these touchable works consist of intricate patterning and detail by burning into the surface of the paper using pyrographic techniques. On an olfactory level Bobier is also presenting a series of beeswax drawings each imbedded with an exotic spice. These works draw attention to both culturally-based culinary flavourings and traditional medicinal properties attributed to the individual spices. In also considering smell as a catalyst or connection to memory the drawings may prompt individualized responses or reactions for the viewer.